The winter holidays! A season for giving, for partying and also a season for regrouping to make sure next year is a good one. We've put together some games, books and apps that we hope will help you in 2012. Happy New Year from all of us! Lose the flabby and befuddled holiday pounds that your brain gains eating and drinking in the holidays with a few mind-sharpening games suitable for your iPhone or your iPod Touch.a. 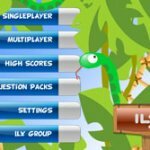 PRINCE2 Foundation Snakes and Ladders and Managing Successful Programmes Foundation Snakes and Ladders are two fang-tastic (!) 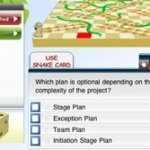 games that test your Foundation level knowledge in both (screen shots from the PRINCE2 game). They're also a great way of interacting with other PRINCE2 and MSP students for they come in multiplayer and/or group play options and you can post your results on social networking sites to see who really knows their stuff! Managing Successful Programmes Foundation Inca Treasure e-Learning Game is a clever and challenging game that really whips your skills into shape. As you move through the game, it throws you questions chosen randomly from the Foundation e-learning course and then hits you with some "super" level questions that you have to answer correctly to capture the ultimate prize. Perfect for would be Indiana Joneses out there! Whether you're working at the office, lounging on the beach or whizzing down ski slopes this winter, find a few moments to catch up on your reading to get ahead of the game. Here's a selection of books available now and in 2012.a. The official PRINCE2 books that take you step by step through the methodology can be found on special offer here. The £99 or EU €119.02 bundle includes: Managing Successful Projects with PRINCE2 Manual - hard copy, Directing PRINCE2 Projects with PRINCE2 Manual, PRINCE2 Pocket book and an A3 poster of PRINCE2 Process Model.b. Illustrating PRINCE2: Project Management in Real Terms, Susan Tuttle, eBook, 226 pages, IT Governance Publishing, out January 2012, ISBN 9781849283267, around £24.95. Landing in our shops on 10th January, Susan Tuttle hopes that this book will give you a clear grasp of PRINCE2. She has chunked the methodology and has aimed to give clear explanations and provide practical illustrations in each chapter. c. PRINCE2 Study Guide, David Hinde, paperback, 600 pages, John Wiley & Sons Inc, out March 2012, ISBN 9781119970781, £29.99. The author’s intention is to provide a comprehensive tutorial on preparing for PRINCE2 exams through, amongst other things, providing clear explanations for using the methodology to handle everyday project challenges. d. Brilliant PRINCE2, Stephen Barker, paperback, 256 pages, Prentice Hall, out May 2012, ISBN-10: 0273750534; ISBN-13: 978-0273750536, from £16 upwards. 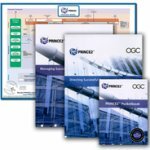 A book for all seasons this one, as it aims to provide everything you need to know about PRINCE2 whether you’re studying or just starting out and want to use it the right way. e. The Virtual Project Management Office: Best Practices, Proven Methods, Robert L. Gordon and Wanda Curlee, paperback, 232 pages, Management Concepts Inc, September 2010, ISBN 978-1-56726-327-5, around $45 and can be found for £20 or upwards in the UK. Once a vague idea for the future, the virtual office is well and truly here so this timely book offers some useful ideas and practices to deal with our modern way of working. f. The New Social Learning, Tony Bingham and Marcia Conner, paperback, 216 pages, ASTD Press and Berrett-Koehler, August 2010, ISBN 978- 1-60509-702-2. If you’re an individual or a company trying to understand the benefits of social learning for project management training then this book could give you an insight into that world. Forward-thinking companies provide social learning opportunities through Twitter, Facebook, LinkedIn to complement the formal classroom and e-learning courses that they provide. Have an "Appy" New Year with some serious and not so serious apps for your smart phone.a. Project Excuses HD by Wurzelkraut, updated 23 June 2011, £2.99. This is definitely one that's not to be taken too seriously! Great fun though and we couldn't resist at this time of year. Compatible with iPad - iOS 4.0 or later.b. Project iQ by Higher Level Systems Ltd, English language, released 21 October 2011, £1.49. This aims to be the must-have tool that will help you prioritise project proposals based on their importance to the business and their chances of success and create a graphical representation of both. Compatible with iPad - iOS 4.3 or later. c. ProjectWise Explorer for the iPad by Bentley Systems Inc, English language, released 10 September 2011, free. This little app is worth a look by anyone who works out in the field and wants secure access to files. Compatible with iPad – iOS 4.0 or later. d. Projects by Thomas Blackburn, English, French, German, Polish and Spanish languages, updated 18 December 2011, £3.99. The application aims to allow you to manage multiple projects and tasks easily and on the move. Compatible with iPhone, iPod touch and iPad – iOS 3.1.2 or later. e. ProjectCalc by Lewis Johnson, English language, updated 14 December 2011, £2.99. 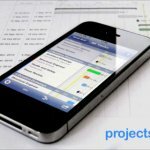 This iPad app aims to calculate project costs for clients or yourself quickly. Compatible with iPad - iOS 4.0 or later. e. Project Stakeholder by Frank Williamson, £2.99, English language, released 15 July 2011. An app for those who need to identify and manage individuals or groups that are likely to affect or be affected by the proposed outcomes of an activity or project. Compatible with iPhone, iPod touch and iPad – iOS 4.2 or later. Finally, if you're thinking of studying PRINCE2 or even if you've recently passed it then the PRINCE2 Process Model (A3 double sided poster) is a handy reference guide to stick just above your desk next to your year planner.